Financial software, strategies, and insights | Economic Security Planning, Inc.
Economic Security Planning, Inc. provides the nation's most powerful and comprehensive financial planning tools and hands on calculation services to households and financial planners. Our unique, widely acclaimed, and highly affordable products were developed by Boston University Professor Laurence Kotlikoff—one of our nation's leading economists and the company's founder. You can use our tools on your own or have us use them for you. Either way our goal is finding safe ways to maximize your highest sustainable living standard. So whether its saving, insurance, Social Security, retirement, career, divorce, housing, or job decisions, we can help. Our planning tools are designed to provide clear, practical suggestions to improve households' financial futures. Our programs are available in household and professional advisor versions and designed to help with important life cycle decisions. Smarter financial decisions begin with smarter software. MaxiFi is far smarter. It not only calculates what you should spend, save, and insure annually to maintain your living standard. It also examines tens of thousands of Social Security, retirement account, annuity and other strategies to raise your sustainable living standard. The result is often tens to hundreds of thousands of dollars in additional lifetime spending. MaxiFi runs on all devices, is easy to use and comes with excellent customer support. The most powerful and comprehensive software planning tool on the market. Its dynamic algorithm takes the guess work out of financial planning. It determines your sustainable living standard—what you can spend on an ongoing basis—and finds safe ways to raise it. ESPlanner can show the living standard impact of important financial and life cycle decisions like switching jobs, retiring early (or later), postponing Social Security, and much more. 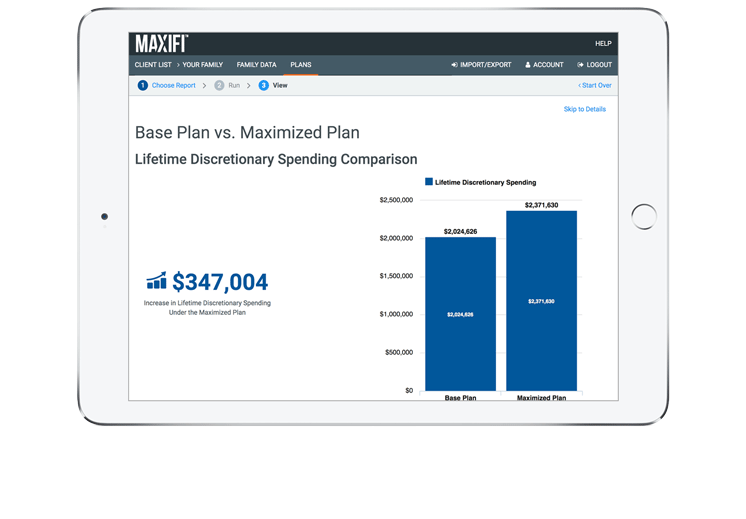 For a detailed comparison of MaxiFi and ESPlanner, view the comparison chart. Divorce is hard enough without fighting over finances. Analyze My Divorce Settlement is an objective way to see how you'll each be treated. It can provide is a clear comparison of both spouse's post-divorce living standards for any proposed settlement. The tool can also help you develop alternative proposals to those you've received. Finally, it can help you find win-win settlements. Top-ranked by the Wall Street journal, this web-based program finds the unique collection strategy that will maximize your lifetime Social Security benefits. Learn when and how to collect retiree, spousal, survivor, divorcee, parent, and child benefits to achieve the highest lifetime benefits. Incorporates all Social Security provisions and options for singles and married couples. We also offer extra support planning services for households and professionals. We can take your data, create the model, and run the plan directly for you in any of our products. With "Expert Review" we can review your inputs, suggest relatively safe ways to raise your living standard, help you understand the reports, and answer questions. For more detail, visit any of the planning tools sites above. Receive periodic updates and learn about our latest intelligent financial software. Disclaimer: The suggestions and recommendations provided by Economic Security Planning, Inc.'s software tools and planning services do not constitute financial advice. ESPlanner’s creators are not certified, registered, authorized, or any other form of financial planners. Economic Security Planning, Inc. does not guarantee that its suggestions and recommendations will necessarily achieve a secure economic plan. Like any software products, Economic Security Planning, Inc.'s software tools may have errors in its underlying code. And the assumptions about the future that it makes and that users input may prove false. The company's financial plans and recommendations, including all of such plans and recommendations provided by its direct planning services, should be viewed as suggestive and informative educational inputs into your financial decision-making. None of our products or services recommend the purchase of specific financial products. Our ESPlanner software does show the possible implications for a household's living standard of different investment decisions. But neither it nor our direct planning services provide any form of investment advice.